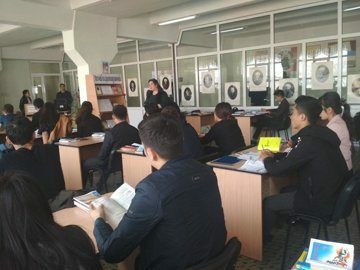 On March 13, 2019 the Information Minutes of the Ahmad Farghoni Regional Information and Library Center in the General Reading Room on the topic of " The beatiful and glamorous poet " was held in connection with the 240th anniversary of the birthday of the educator poet Uvaysi (1779-1845). At the end of this information the director of the general reading room O.Abdullaeva conducted the meeting. O. Abdullayeva briefly told the readers about Uvaysi's life and creation. Uvaysi - a poet, a classic representative of Kokand (Uzbek) literature in Chigatay language. Together with Nodira and Mahzunas are representatives of women's poetry in Kokand. Uvaysi was born in Margilan, a simple but educated family. His father gave him the idea of ​​secular science, especially about the structure of Uzbek poetry. A number of scientists called Uvaysiy a sad poet. This is definitely an excuse, since there are many poems describing her inner world as "mother who has lost her children". The creative heritage of Uvaysi is distinguished by its deep meaning and high artistic skill, and will undoubtedly serve readers for many years. An exhibition titled " The beatiful and glamorous poet" was also organized, where a number of Uvaysian publications were offered to the readers. At the same time, the library has the following publications: Uvaysiy, "Mazmun ma’dani", T .: Academician, 2010, "Uvaysiy izdoshlari", T .: Ferghana, 2007, and other publications and press releases were read to the attention of readers.